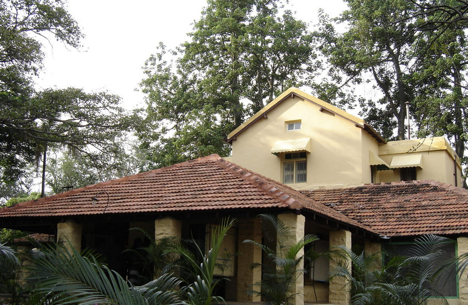 Residence of Svyatoslav Roerich & Devika Rani Roerich, Tataguni, Kanakpura Road, Bangalore. A gallery of Svyatoslav Roerich’s paintings will be opened in India in 2018. To be located in the "Tataguni" estate earlier owned by Roerich and his wife Devika Rani, the famous Indian film actress, authorities in Karnataka state in South India have allocated 250 million rupees for the project. The ‘Tataguni’ estate, earlier owned by Svyatoslav Roerich and his wife Devika Rani, the famous Indian film actress, will host a permanent gallery of S Roerich’s paintings from 2018. Money has been allocated for construction of the gallery to begin on the estate, which had fallen into disrepair after the death of the owners. Karnataka state authorities have assigned 250 million rupees for this project. When alive, Roerich had dreamed of building a cultural and educational centre in the estate. Twenty years after his death, Roerich’s dream looks set to become reality. "The complex will include a gallery and a residential complex for artists who will come to Tataguni. It will be spread over 25 acres of the estate, Rangayah Gopal, head of the department of archeology, museums and heritage of the Karnataka government, told RG. The permanent exhibition will include over 240 of S Roerich’s paintings, which are now kept at the estate, and copies of his paintings which are on display in a gallery in the city of Mysore. Exhibition halls displaying the works of contemporary artists will also be opened. According to Gopal, building modern galleries will be based on the Netherlands model of the Van Gogh Museum in Amsterdam. "Initially, we planned to build a museum of international level, but because of financial constraints, we had to simplify the project. The state government has recently approved the allocation of 250 million rupees for the project, which will be spent in stages. We are currently preparing the necessary documentation. Once approved, we will begin the works. According to our estimates, building the museum will take about three years," said Gopal. Svyatoslav Roerich was the son of famous Russian traveller and artist Nicholas Roerich. He began his career as a portraitist. One of the distinctive features of his work was a deep feeling of the person’s character whose portrait he was painting. Roerich painted numerous portraits, two of them were of former Indian Prime Ministers Jawaharlal Nehru and Indira Gandhi. They adorn the walls of the Indian Parliament’s historic Central Hall in New Delhi. S Roerich and Devika Rani, once a leading lady of Indian cinema, purchased the "Tataguni" estate in 1948 and lived there for almost half a century. Roerich died in 1993, his wife passed away a year later. They were buried within the estate. In 1996, the estate became state property. The ‘Tataguni’ property includes two lakes and an extensive plantation of rare aromatic trees. The estate is spread over a total of 468 hectares.